Look at that cover! Adorable! 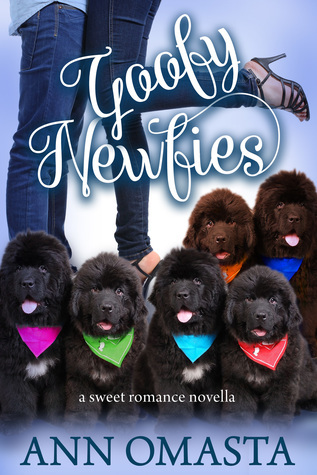 Goofy Newfies was fun, too, as Lily-- our newly widowed and crotchety heroine-- meets her match in a wiggly little newfie escape artist and his hunky foster daddy who is trying to find homes for the herd of darling little puppies. Yes, so, Lily is a handful. She's grumpy and puts her foot in her mouth...often. And is dealing with a scandal after something she wrote about her dead husband went viral. She could be judgy and was totally like a wounded animal lashing out. But she won me over by the end as Van and his brood of puppies wore on her bit by bit and helped her find her nice again. Each chapter was based on one of the puppies finding it's forever family which I loved. And how each puppy changed the lives of the families they joined. It was a sweet little romp. What do you get when you combine a dash of romance, a pinch of humor, a ton of fun, and quite a few pounds of sweet and fluffy Newfoundland puppies? This delightful recipe makes for a heartwarming read that is sure to leave you wanting more. Rascal, Ruby, Rowdy, Riley, Red, and Ripple (a/k/a Princess) wiggle their way into the hearts of their unsuspecting people. These lovable gentle giants thunder in and enhance the lives of their families in ways their humans would never have imagined to be possible. Snuggle up with these adorable Goofy Newfies and let them try to convince you that drool is cool!